Today’s post takes a snapshot view of the top ten rated IPO’s to start 2008 according to my fundamental screeners and research. You will be familiar with many of the names as they have been covered on the blog throughout 2007. They still stand at the top of the list of market leaders in this area. The names may be getting old but they still work and working in this business means money. NOTE: this does not mean they are instant or current buys, it just means that they carry the strongest fundamental ratings that I follow. What ratings do I use? I’ll make a brief comment about each stock and let you know what I see while analyzing their charts as of Friday’s close. The stocks are listed based on overall fundamental ratings (not technical). The chart looks to be craving a correction, one similar to the pullback in July 2007 which watched the stock give back more than 37% (from $119 to $74). I would only be inclined to add shares near the 50-d and/or 200-d moving average. The stock is correcting back to the 200-d m.a. for the second time in as many months. The ideal accumulation area is now. The trade may not work but it’s a game of odds. A green light for a buy! The stock is extended from all important longer term moving averages. Accumulation can take place along the 50-d m.a. (currently near $61). The stock has never tested the 200-d m.a. ; a correction to this level would be drastic but telling long term (in years). 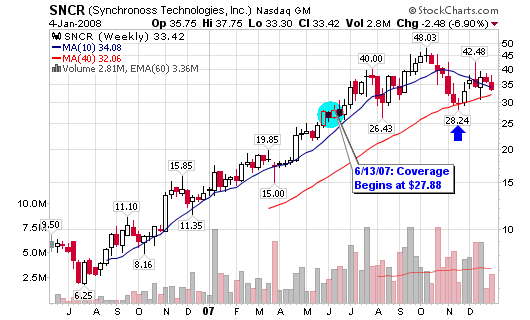 The stock is building its first legitimate base pattern which has currently lasted 13-weeks in length. A move above $45.20 is a buy signal according to CANSLIM rules although the handle may not qualify for a true base (too sloppy and steep). A long term accumulation point would be just above the 200-d m.a. We have another stock with a first time appearance on the blog. 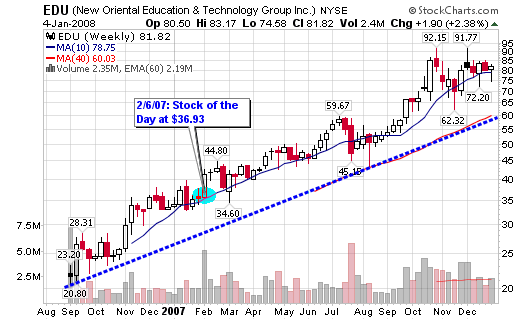 It shot up from $25 to $51 in 2007 for a solid 100% gain without violating the 200-d m.a. An ideal entry is along or slightly above the 200-d m.a. A violation of the 200-d m.a. on heavy volume would be negative and should steer you away from a position. The stock is currently basing with support along the 50-day moving average. A move above $85 could allow the stock to challenge all-time highs (above $92). The stock is under pressure and trending lower over the past two months. Volume has been light but it was the holiday season so January should be a test of action. The P&F chart shows further downside risk and the stock trades under the 50-d m.a. I would not be a buyer unless the stock could recover the 50-d m.a. on above average volume. 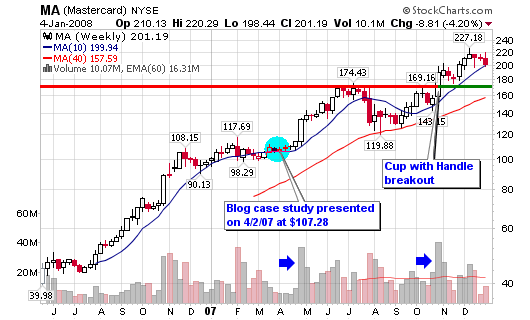 I will be analyzing the stock in detail tomorrow for a case study “stock of the day” presented on Tuesday. 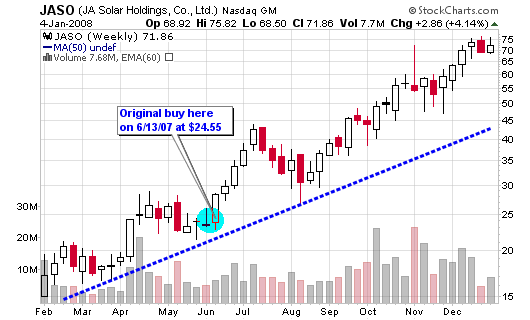 The stock took a hit to the end the week on heavy volume which concerns me but corrections are healthy. A pullback to the mid $20’s could be possible based on the prior pullback in October and November. I am looking to add shares based on institutional numbers alone. A superior performer over the past year and one that I would not have a problem accumulating in the new year if the opportunity presents itself. The 200-d m.a. would be my ideal entry area. I am also looking forward to the IPO of VISA which could lift the group (especially Mastercard). Lastly, fundamentals are typically late to the party so please monitor the charts as they will show us the first signs of trouble. Many stocks have sported superior fundamentals while breaking down technically on the charts (tricking value investors into accumulating more shares when turbulence was on the horizon). Please don’t blindly buy or sell the stocks listed above until you have done all the proper research both technically and fundamentally. Nice update – the solars are scary. I wouldn’t short them, but they look way too much like dotcoms did 7 years ago. A solid observation. However, many people said that about Chinese stocks, this time last year. The index was trading at 3,000 and people were saying BUBBLE. It’s now at 5,300 (reached 6,000). Solars may be done or they may just be getting started. Time will tell. Nice to read you. I already some of your IPO picks in my basket: JASO, VMW and YGE. I also have some others IPO that I consider interesting: MELI, SLT, WATG and GA. It could give you some ideas. SNCR crushed since your post…evidently you guessed wrong on that one but you called it a game of odds. Odds are selecting picks from a typical blogger are as poor as those you get from say ….a Wal Mart greeter. No guess – it was a list of top rated fundamental stocks – NOT A LIST TO BUY as noted in red. I don’t pick stocks on this blog. I teach how to trade and show what I do. I don’t tell others what to trade – I am not a stock picker. If anything, I provide research and allow you, the investor to make the decisions for yourself. FYI: SNCR was up 36% for the cp.com portfolio last year (2007) – that was a buy.